Who Does Everyone Think the Jets and Giants Will Draft Tonight? This season’s Knicks, loaded with talented players, ended the year with the franchise’s best winning percentage since 2001. But that’s come only after bouts of brilliance, stunning impotence, and plain bad luck that’s left fans wondering, given all that talent, what could have been: What if Amar’e Stoudemire had been healthy all season? 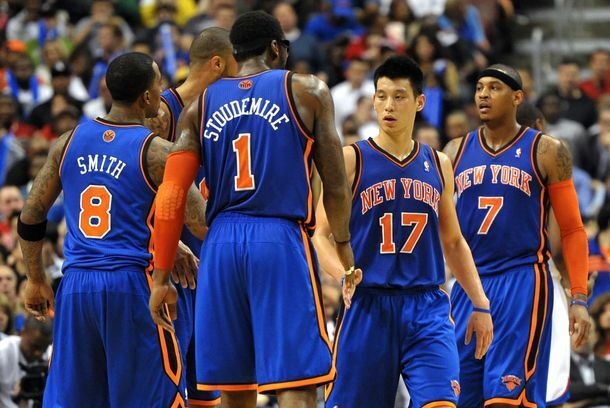 What if the Knicks would have recognized Jeremy Lin’s talents immediately … and he had been healthy all season? What if Carmelo Anthony had learned how to play with Lin (and for Mike D’Antoni) ... and had been healthy all season? What if? We asked stats master Bradford Doolittle of Basketball Prospectus to answer that question. Doolittle fed an ideal Knicks season — one in which every player performed at their highest previously established level (no off-years from Stoudemire and Baron Davis), under the optimal distribution of playing time (i.e. Lin beginning the year as a starter), and without games lost to injury — into his projection system. That’s no way to run an actual projection system, which would use less-giddy estimates. (Doolittle made this very clear. He would never, ever predict this for a team; this is just the scenario under our pie-in-the-sky, everything-went-in-the-best-possible-fashion control group.) But this is Knicks Utopia, where everything went right, where the perfect-case scenario happened every time. How'd they do? Check it: The team finished with a 57-9 record, good for the second-best regular season winning percentage in NBA history. How might this have gone down? February 10, 2012. President Obama decides to award the National Medal of Honor to D’Antoni and Lin, requiring them to miss two games to attend the ceremony. Their fill-ins, little regarded point guard Toney Douglas and assistant coach Mike Woodson, win both in dramatic fashion, and the nation is briefly swept up in Douglasanity. Toney ends up on the cover of two consecutive issues of Sports Illustrated, the inspiring story sullied only by ESPN.com’s tacky “Chink In the Armor” headline reference to Douglas’s great-great-grandfather, who was killed in a jousting match. March 7, 2012. The Knicks suffer their only two-game losing streak of the season, falling to Dallas and San Antonio on the road — but the trip isn’t a total wash, as J.R. Smith uses downtime before the games to solve both the Bush National Guard mystery and the JFK assassination, posting his findings on Twitter between pictures of women’s butts. April 26, 2012. The regular season ends with a 101-99 loss to the Charlotte Bobcats when D’Antoni rests all his regulars, from Anthony to Lin to Stoudemire. “They haven’t been hurt all season — they’ve been almost inhumanly healthy, now that I think about it — but they deserved a night off,” D’Antoni says. May 16, 2012. After sweeping the Philadelphia 76ers in the first round of the playoffs, they hammer the Boston Celtics in the Eastern Conference Semifinals in five games. Paul Pierce makes only three of his 57 shots in the series. “All I can say is that the Knicks finally and emphatically paid me back for all the pain I’ve caused their fans over the years,” he says in a postgame press conference. June 3, 2012. The Knicks take a 3-0 lead over the Miami Heat for the right to go to the NBA Finals … but minutes before Game Four, MSG team president Jim Dolan announces he has hired Isiah Thomas as the team’s new general manager. The Knicks go on to lose the next four games, and in the off-season, Isiah trades Carmelo, Lin, and Amar’e for Eddy Curry and Jared Jeffries, even though Jeffries is already on the team. Alas, even in our fantasies, Jim Dolan is still in charge.